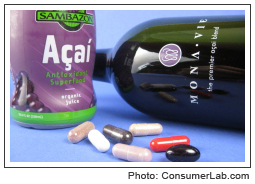 Make sure the acai berry supplement or beverage you use met our quality standards in our review! Acai berry is rich in antioxidants and has been called a "super fruit." Acai berry has also been widely promoted for the treatment or prevention of many ailments -- but are these acai berry claims true? For this review of acai berry products, ConsumerLab.com purchased and analyzed a wide variety of acai berry supplements and beverages. While it is not currently possible to determine the amount and authenticity of acai berry, all of the acai berry products we reviewed were found to meet quality criteria for heavy metal and pesticide contamination. However, our review also revealed potentially dangerous laxatives in one supplement and over 100 mg of caffeine in another. Some product labels don't even tell you how much acai berry they contain. We also encountered worrisome billing practices with two companies. You must subscribe to get the full test results, reviews and ratings for acai berry supplements and acai berry juices or beverages along with ConsumerLab.com recommendations. You will get results for six acai berry supplements and beverages selected for testing by ConsumerLab.com and for six other brands of acai berry supplements evaluated through our voluntary testing program, as well as information about two acai berry products similar to ones tested.